Finally free of the airport, we had walked out the doors and set our feet on American soil. I had developed a tan after a mere few hours working in the Port-au-Prince sun, and I payed dearly for it. When I arrived back at the house, people stared at me in surprise. My skin, which was pasty Oregon white before I left, was dark and sun kissed, glowing. Even I was taken off guard by the face that looked back at me in the bathroom mirror. I had worn sunscreen to no avail, and no matter how exotic I looked, it didn’t change the fact that every inch of skin that had been exposed felt as if it had been scalded in hot water. That night, I sat in the dinning room, silent, watching some of the girls getting their hair cornrowed by the Haitian workers who helped out with the preschool, waiting for my burns to calm down. Later that evening, I remember curling up on a leather couch with my Bible, feeling a good sort of tired. The mosquitoes that ate me alive. Crawling into cupboards to wash out rat feces. Giant spiders that ran faster than my eyes could track. The fear of Cholera in every shower, making sure none of the water reached inside my mouth. The deep gutters that held a soup that looked far more mysterious and dangerous than the stuff in those blue portable bathrooms we rent for concerts and parks. Carrying buckets of rocks on my shoulder down a hill with the guys; my arms crying out in exhaustion, but my pride and determination pushing me forward. The aroma of the bakery as we waited outside for our bread. The outfits we had brought with us from the States, and the sight of all the little shirts, skirts, pants and shoes lined up on a big dinning room table, name tags on each one. Dressing the preschoolers in their clean, new outfits, and watching them smile and smooth down the soft, new fabrics…Praying that their parents wouldn’t sell the clothes for food. Sunsets, a glorious backdrop to a landscape ravished by heat and and heartache. The value of clean water. A sea of beautiful, dark complexions. Colorful Tap taps and run down trucks weighed down almost to the breaking point with passengers. The smell of diesel running through the exhausts of engines that require regular gasoline, and of burning trash on every street. The men and women walking through the dirt-packed roads in immaculate pressed white suites. Being able to hear Haitian Christians singing praises in church from over half a mile away. And that moment you realize they’re singing of happy things because they are truly already familiar with brokenness and suffering. They have no desire to cry in order to feel spiritual. The sweetest mangoes spritzed with lime. Washington apples in the local grocery store. A people indifferent to their own poverty. Oil based paint, and my subsequent appreciation for latex based ones. Workers at the missionary’s house sitting beside you as you’re dipping your feet in the pool, showing you their cherished English vocabulary book. Looking into the face of long term missions, the many hardships and trials, yet also appreciating the eternal vision. This, too, shall pass. Leaving the city, a place where traffic is at a constant gridlock, a mile taking an hour, and relishing the wind in your face as the truck drives a remarkable and unbelievable 50 mph. Ragaman. An energy drink that looks like an Asian beverage, tastes almost like an apple Jolly Rancher, and was initially unimpressive. By the end we all considered it the most delicious drink we’d ever had. The off-tune version of the Titanic theme emanating sadly from the water trucks, heralding their arrival dawn to dusk. Arriving to white walls, and leaving them yellow. A small, quiet child crawling into your lap. Toppled buildings, men separating caved roofs and toppled cement walls over a year after the earthquake. The New Jerusalem, a desert city of tents and stones reaching as far as my eyes could see. 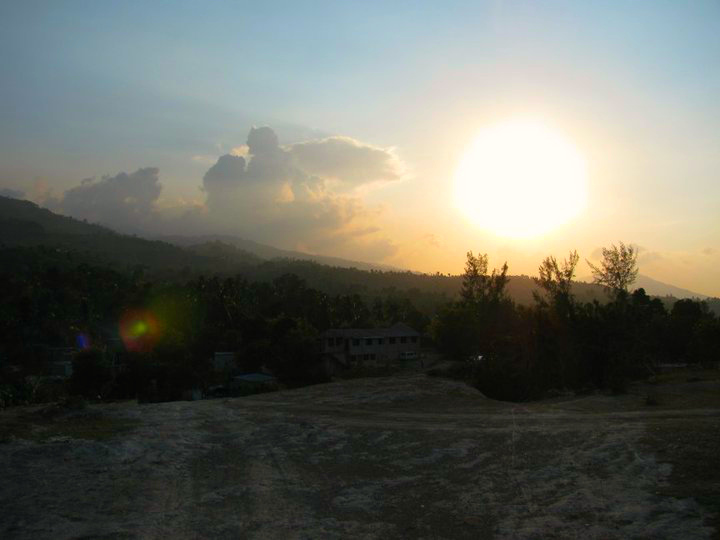 As I had left Haiti, I had also looked back over this whole world, and I knew one day, near or far, I would leave all of it behind, and I wondered what I would do with the time I had left. I wondered how many I would take with me.